Well. How hard can it be? You just pick the baby sea turtle, put it in the sand, and let it move to the sea. Won't take too much time. Piece of cake. Apparently it's not that easy. 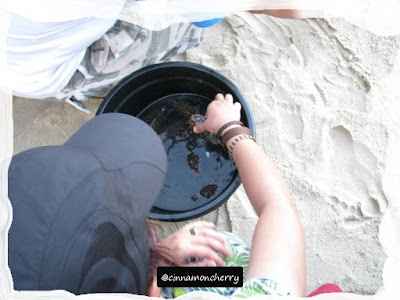 There is a certain procedure in Tanjung Keluang to release the baby sea turtles. First, you take the baby sea turtles (approx. 3-4 months old) near the beach. About 5 meters away from the waves. 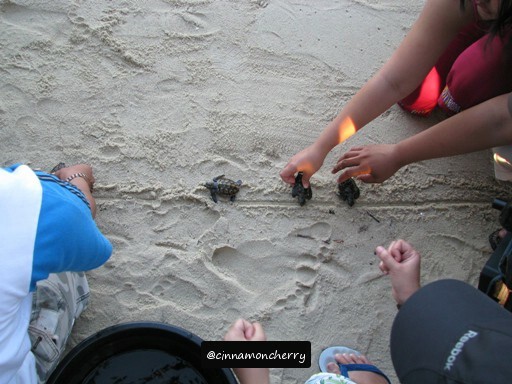 Then, making sure the sandy path is unobstructed in front of you, you pick the baby sea turtle and put it on the sand. This is the important part: make sure the head is pointing toward the land, not toward the sea. "Huh? Why is that?" you might ask. It is done that way to instill a homing memory (for lack of better term) for the baby sea turtles. One day, hopefully, the female sea turtles will remember Tanjung Keluang and lay eggs there. Thus, people in Tanjung Keluang will be able to help more baby sea turtles to hatch and then release them to the sea. We learned that the process took quite a while! Not all baby turtles were alert! Some seemed to freeze. The guide told us it might take up to TWO HOURS. We have to be patient and wait until the baby sea turtles move on their own. Thankfully the baby sea turtle that I chose was relatively agile! Here you can see it's heading toward the sea, and I was busy encouraging it to move faster! To me, it's a moving experience, releasing tukik to the sea. It symbolizes courage and of course, hope. May you all grow into big, healthy sea turtles and return one day to Tanjung Keluang!